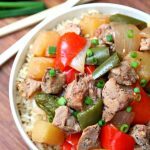 You just can’t go wrong with easy slow cooker recipes and it doesn’t get any easier than this Sweet and Sour Pork. All you have to do is cut up your ingredients and dump it all right in the slow cooker. Prepare some rice and you’ve got an easy and delicious dinner. Cut green pepper, red pepper, and onion into chunks. Combine pork, pineapple, pineapple juice, peppers, onion, vinegar, ginger, soy sauce and brown sugar in slow cooker. About 5 minutes before serving, mix cornstarch and water in small bowl. Add to slow cooker and stir into pork mixture. Cover and cook on high for 5 minutes or until sauce thickens.